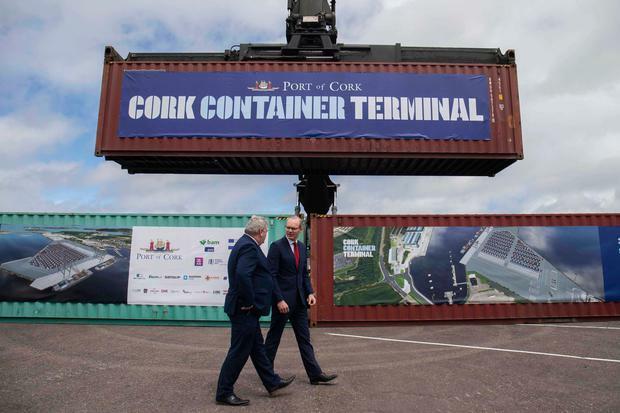 Cork’s new €80m container terminal is aimed at future-proofing the port and kick-starting the regeneration of the city’s docklands. The Port of Cork said the project is a key element in boosting economic growth in the south-west region and the expansion of Cork city. The container terminal will initially offer a 360-metre quay with 13-metre depth alongside and will enable larger ships to berth in Ringaskiddy. It also includes the construction of a 13.5-hectare terminal and associated buildings as well as two ship to shore gantry cranes and container-handling equipment. The project will become fully operational by 2020. Port of Cork chairman John Mullins said it was a vital development for the facility. “The Port of Cork’s redevelopment at Ringaskiddy is a key growth enabler for both Cork city and region as well as the national economy and will enable the port to deliver more efficient container handling facilities, replacing the existing container terminal at Tivoli, and securing the Cork container terminal as an international gateway for trade well into the future,” Mr Mullins said. “The transfer of port-related activities from the city and Tivoli will create a real opportunity for Cork dockland sites to be redeveloped in the near future,” he added. Dockland regeneration has been identified as a key element in the plan to increase the size of Cork city. The port said the new terminal is the largest single investment in its history. “This development will secure the future for the Port of Cork, and ensure the trade gains are translated into significant economic benefits for the people of Cork and the Munster region, as well as the national economy,” Port of Cork chief executive Brendan Keating said.